The core appeal of first-person shooters is simple. Forget their narrative depth, explosive set-pieces and massive budgets. At their core, first-person shooters are, and always have been, about making a simple gameplay loop – aiming, moving and shooting – feel good. Striking the right balance between precision, feel, feedback and immediate, instinctive strategy is why successful shooters like Halo, Call of Duty and Destiny have resonated with such wide audiences over the last decade. That's really all there is to it, even in complex modern FPS like Titanfall 2, which combine single-player story, puzzles, mechs, balletic on-foot action, extreme agility and RPG-style upgrades. That satisfying immediacy is what has made FPS the go-to genre of modern blockbusters, but just how did we get to where they are today? Well, here's the 43-year history of shooters as we know them, and how a philosophical divide between PC and console gaming – fueled by their respective technical strengths and limitations – led to the cross-platform, multi-featured, FPS games of the right here, right now. The earliest examples of first-person go back to the beginnings of video games themselves. Around 1974, two early developers - Steve Colley and Jim Bowery - worked on separate titles that were undeniably influential to the future of gaming. First, there was Colley's Maze War, a simple black-and-white puzzle game where players would wander through a maze looking for other avatars, represented by floating eyeballs. When you saw another eyeball, you could shoot it to gain points. This may sound like brain-dead-level simplicity, but for the early '70s, just about all of these things - the first-person view, the avatars, its in-game level map - were firsts. Around the same time, Bowery debuted Spasim, a space flight simulator also set in a first-person view. Like Maze War, movements were slow and simple, and turns could only be done in 90-degree angles. Unfortunately, neither game was released commercially; instead, they were more like radical projects shown off to select university students. Everyday folk wouldn't get their first shot at first-person shooters until the early '80s, when a handful of titles influenced by the early concepts provided by Maze War and Spasim launched in arcades. The most popular of these was 1980's Battlezone, a tank combat sim that has now been reborn in PlayStation VR. Back then it used black and green vector graphics, basic background environmental effects (like an erupting volcano), and addictive, score-based gameplay centred on shooting up as many enemy vehicles as possible. As a result, it would remain popular with arcade-going high score chasers for many years. Besides Battlezone, the majority of other '80s shooters just weren't ready for primetime yet. The technology wasn't quite there, especially at home, and developers were still fumbling around with how to best use this relatively unknown genre. There were a few successes with light gun peripherals - like Japanese developer Taito's Operation Wolf - but it wasn't until MIDI Maze released for the Atari ST in 1987 that FPS games took the next step forward. MIDI Maze (released as Faceball 2000 for the Game Boy in 1991) was a goofy yet charming game, featuring big, yellow, murderous smiley faces as avatars. As far as gameplay went, MIDI Maze didn't do much different mechanically from other shooters, but it was notable for being the first legitimately robust multiplayer 3D shooter for an accessible home platform. It required a complicated LAN setup, yes, but MIDI Maze gave players the first hint at just how vital multiplayer FPS would eventually become. Throughout the late '80s and early '90s, Texas dev Id Software had worked on a handful of first-person shooters that gradually improved with each passing release. Games like Hovertank 3D and Catacomb 3-D saw John Carmack and company experiment with new technological advancements, including fully realized 3D environments. But when id released Wolfenstein 3D for the PC in 1992, it changed first-person shooters forever. Wolfenstein was a revelation. Environments and character models were impressive for its time, and it ran more smoothly than any 3D shooter that had come before it. Because of this, Id was able to craft a shooter that mixed the first-person perspective - now finally beginning to come into its own - with the ultra-fast pace of many third-person action games in arcades at the time. This effectively popularized the run-and-gun style shooter, making it accessible to all. It popularised many aspects of shooters that are taken for granted nowadays, like health and ammo packs, the ability to freely select from multiple weapons with a variety of different combat purposes, and being able to save your progress at any point. Oh, and it let you kill Hitler. Mecha-Hitler. Though Wolfenstein was a huge success, Id cemented its iconic status with the 1993 release of Doom. Simply put, Doom is one of the most important games ever made. It improved upon just about every aspect of Wolfenstein 3D, and established first-person shooters as a genre that would last well into the future. Doom looked better, played better, blew out level design in every direction, and gave players more things to do than any shooter ever had. Its 3D environments were rich and filled with now-iconic demonic monsters, and its slick, fast, deceptively strategic play vastly improved on Wolfenstein's already-successful run-and-gun gameplay template. It sported a wide variety of usable weapons, from the chainsaw to the infamous BFG. It also provided users with Doom WADs, which allowed players to create levels and mod the game to their heart's content. Oh, and it also featured cooperative and deathmatch multiplayer, by way of LAN or dial-in connections. To say these non-campaign modes were popular would be an immense understatement, as Doom was the first FPS to successfully foster the kind of massive-scale user base so many shooters still seek today. Every major PC game maker wanted their own Doom, and the vast majority of shooters released after 1993 wanted to be Doom. 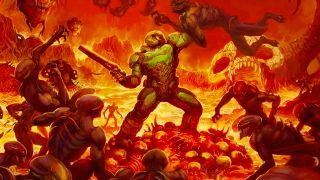 These clones flooded the market for a good while - in fact for a while, before it was full cemented as a genre in its own right, "Doom clone" was the de facto term for any first-person shooter - but a few classics came out of the sea of copycats. One of the earliest came in 1994, when a little developer named Bungie released the first game in its eventual Marathon trilogy. Focusing around a relatively nuanced sci-fi plot and an expansive multiplayer suite, the Mac-exclusive shooter was a unique hit, and also cemented the conceits that Bungie would later build upon with Halo and Destiny. The following year brought Star Wars: Dark Forces, which allowed players to look up and down in a fully 3D environment - for the period, a big deal in terms of immersion and environmental design - as well as delivering levels that were more in-depth than was typical at the time. Finally, there was 1993's Duke Nukem 3D, which had... attitude. Its raunchy sense of humor, tight, memorable action, and highly interactive, relatively realistic level settings gave it a true personality that resonated with millions of shooting fans. It even spawned a sequel 15 years later, which was... well, it was. Let's leave it at that. Quake's single-player mode is great, fast, frantic, brutal, kinetic, and very smart indeed. But, after Doom, Id knew that multiplayer was where the long-term life of shooters resided. Thus, it jumped into the market early with a multitude of deathmatch modes and special multiplayer support features like clans and modding abilities. Quake's progressive, physics-driven nuance rapidly turned up all kinds of hidden quirks and gameplay tricks, like rocket-jumping and strafe-jumping. Once harnessed by the game's rabid community, fan passion and game versatility combined to turn Quake into one of the first legitimate eSports. It still has a giant annual convention/LAN party named after it, Quakecon, where all the biggest reveals from Id and parent-company Bethesda happen. Multiple sequels were later released, with the legendary and still unbeaten Quake 3 Arena focusing on nothing but multiplayer. With spiritual follow-ups Quake Live and the upcoming Quake Champions continuing to carry the MP torch, it's clear that Quake's original blend of immediacy and depth really, really got it right. You've probably noticed that all of the FPS titles we've discussed have been for either arcades or PC. There's a reason for this: console shooters were never really at the forefront of the genre, largely due to the limitations of early controllers vs the almighty keyboard and mouse set-up. That changed in August of 1997, when Rare's GoldenEye 007 took the James Bond license and wrapped it around an impeccably designed, console-optimised FPS. Released on the Nintendo 64, GoldenEye almost exclusively tapped into a console market that had not yet gotten FPS fever like its PC counterpart. It had excellent level design in single-player, a now-legendary four-player local multiplayer mode, a cast of iconic Bond characters, and an engaging shift away from the run-and-gun action seen in Doom and Wolfenstein, toward more methodical, option-fueled play. GoldenEye moved more slowly and realistically, even putting an emphasis on stealth gameplay, previously unexplored by the genre's greats to date. Most console developers had a hard time catching up to Rare's platform dominance. Instead, the best shooters of the late '90s still resided on the PC. 1998's Half-Life, for example, was the first game from developer Valve. Deeply cinematic, superbly written and designed, and focused on a solo campaign driven by deep environmental interactivity and staggeringly lifelike, challenging enemy AI, Half-Life effectively did for the craft of single-player FPS what Quake did for multiplayer. Again, new standards were set. In stark contrast, the following year saw the release of Epic's Unreal Tournament, Id's aforementioned Quake 3 Arena, and the Half-Life mod Counter-Strike - all of which focus on their online components. UT and Quake were hectic and ultra-fast-paced titles that had almost no regard for single-player, and Counter-Strike went from user-made mod to widespread phenomenon thanks to its simple - yet tactical - premise, brutal difficulty, and intensely dedicated player community. And even aside from the obvious big-hitters, plenty of other wonderful and increasingly diverse PC FPS were released during this period - from Starsiege: Tribes, to Tom Clancy's Rainbow Six, to the RPG-tinged System Shock 2 - making the turn of the century a golden age for keyboard and mouse shooting. Truly, the days of the "Doom clone" were well behind us, the genre now matured into a wide, ever-expanding, legitimate, creative ecosystem. The turn of the century also brought a new generation of consoles that were finally capable of running FPS smoothly and effectively. By 2001, there weren't many console shooters - TimeSplitters and Perfect Dark aside - that could be considered flagship, high quality titles. Microsoft changed this by buying Bungie and helping transform its next project, a real-time strategy game called Halo, into one of the most influential franchises ever. Halo essentially did for console shooters what Doom did for the genre on PC. Its strong narrative, free-flowing and cinematic gameplay, advanced enemy AI - and possibly most importantly, the best, most convincing translation of FPS controls to a twin-stick-controller - all helped Halo to become the ONLY game you needed on Xbox. Future installments, alongside Microsoft's Xbox Live service, would add one of the deepest multiplayer components ever seen on console. In fact, Halo 3 still remains one of the best multiplayer shooters around, over a decade after it was originally released. Like Doom before it, Halo seemed to convince the large majority of developers that making high-quality first-person shooters was the key to future success. The mid-2000s brought a wealth of excellent console shooters to go along with the continued - albeit slightly lessened - stream of great PC ones. These included massive amounts of World War 2 shooters like Battlefield 1942 and Call of Duty, highly anticipated sequels like Doom 3 and Half-Life 2, and new franchises like Far Cry and PlanetSide, among many others. One particularly noteworthy title was 2002's Metroid Prime for the Gamecube. It transplanted Samus Aran's side-scrolling puzzle-adventures into a modern FPS framework while still retaining the original games' feel and soul. Perhaps more importantly though, it was one of the first popular FPS games to place a heavy emphasis on adventure game aspects like exploration and platforming rather than just shooting. Series fans and FPS fanatics fell for the game en masse, making it one of the most critically and commercially successful games ever released on the GameCube. In 2007, one game set the standard against which all future FPS would be measured (or at least, all FPS for a very long time): Call of Duty 4: Modern Warfare. While the Call of Duty franchise was popular during its early days - hence the fast expansion of the World War 2 sub-genre - Modern Warfare shook up the landscape by bringing the guns, the settings, and the scenarios bang up to date, and added some truly unforgettable, brilliantly scripted missions to become one of the most rounded, loved shooters (and games) ever created. It wasn't just the campaign either - Modern Warfare brought some truly innovative online features, like customisable Perks, levelling, and Prestige, kickstarting and hooking a loyal and talented fanbase that still plays the game today. All of this, combined with its fast, twitch-heavy gameplay, also made CoD the premium choice for eSports, and the dominant fixture in the gaming release calendar every year for almost a decade. While the FPS genre undoubtedly improved bit-by-bit after Modern Warfare, there wasn't a stand out 'Eureka moment' until 2014, when Bungie - partnered with Activision - released Destiny. A console FPS that's always online, and fueled by community-driven co-op play and persistent MMO-style progress, Destiny was a hugely ambitious title when it first launched. While not always perfect in its first year, and initially lacking in certain areas like explicit narrative and content breadth, Destiny attracted a massive, fiercely loyal community filled with individuals who happily continue to put hundreds and thousands of hours into the game. Now vastly improved from its early days - when, despite its flaws, it was still good enough to win our Game of the Year Award for 2014 - Destiny is now a genre leader, a brilliant, nuanced, rich, and fine-tuned goliath that games of all other genres are drawing inspiration from in an attempt to replicate its enormous success. Meanwhile Bungie has announced Destiny 2 for September, which could well mark the next big, evolutionary step in the unstoppable FPS genre.